I usually keep searching for cake recipes on the net. 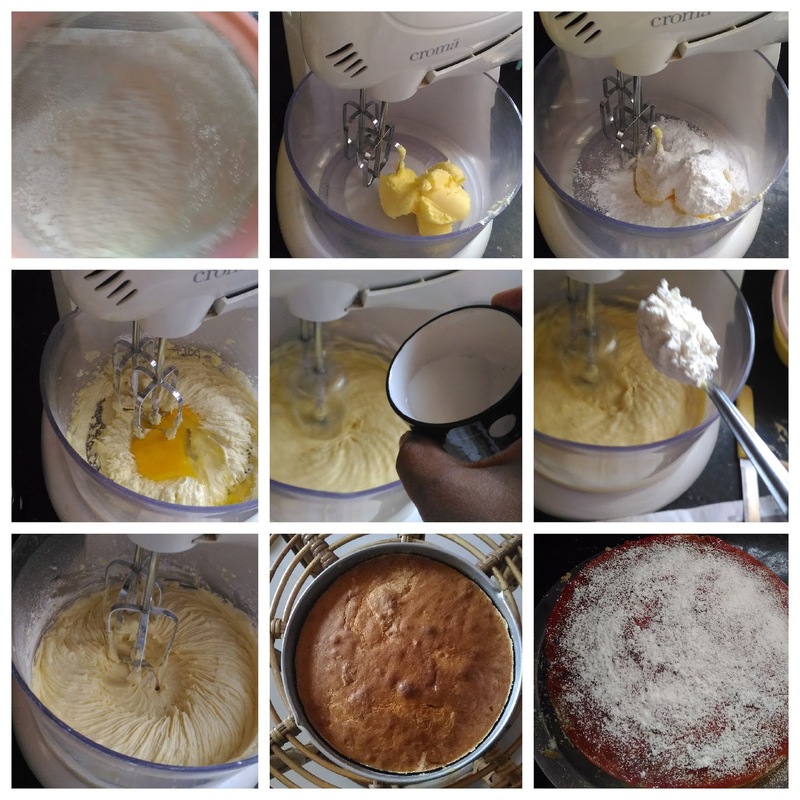 I came across a very easy recipe with simple ingredients in Jamie Oliver site called Victoria Sponge Cake. The name itself was tempting me to try it. 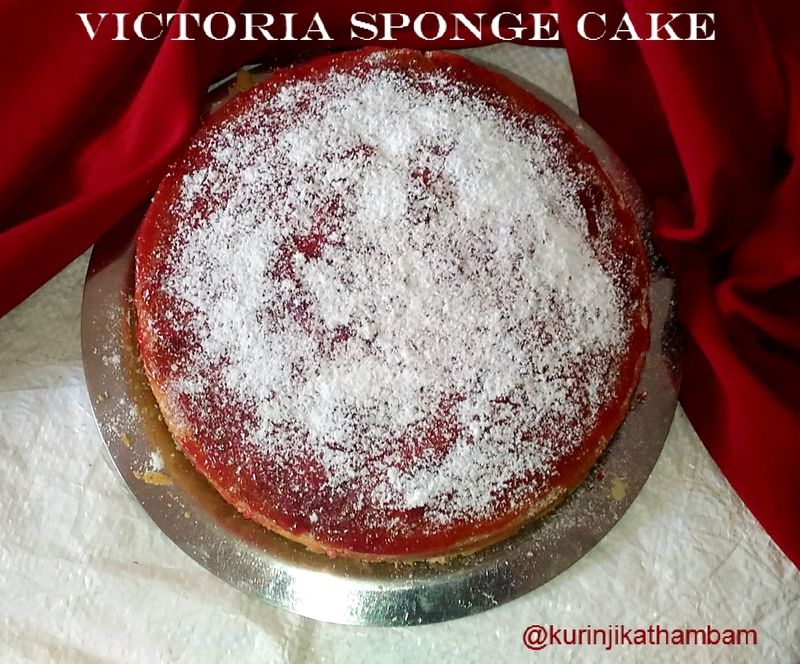 The story goes that Queen Victoria always used to eat two slices of the cake before tea. When I served it to my family everyone asked where I bought this cake, thinking it was store made. They could not believe that I had made it. I made it many times. My family was joking that we have also become fans of this cake, just like Queen Victoria. 1. Sieve maida and baking powder together twice or thrice. Keep it aside. 5. Now break one egg and add with the butter mixture. Beat the mixture till the egg mix well with the butter. 6. Now add the second egg and beat the mixture till the egg mix well with the butter. 7. Then add the third egg and beat till the egg mix well with the butter. 8. Now add the milk and essence with the butter – egg mixture. 9. Now add sieved flour (from 1) little by little, beat them at low speed till they incorporate with the butter mixture. Cake batter is ready. 10. Meanwhile, grease the 9 inch pan with butter and dust with flour. 12. Preheat the oven for 200 degree Celsius. Bake the cake for 25-30 mins or inserted tooth pick comes out clean at 180 degree Celsius. 13. Allow it to cool down completely. Remove the cake from the pan. Then apply jam over the cake. Immediately dust the powdered sugar over the cake using sieve. Wow yummy and delicious Queen Victoria Sponge Cake is ready to serve. 2. You can use any variety jam or fresh cream. 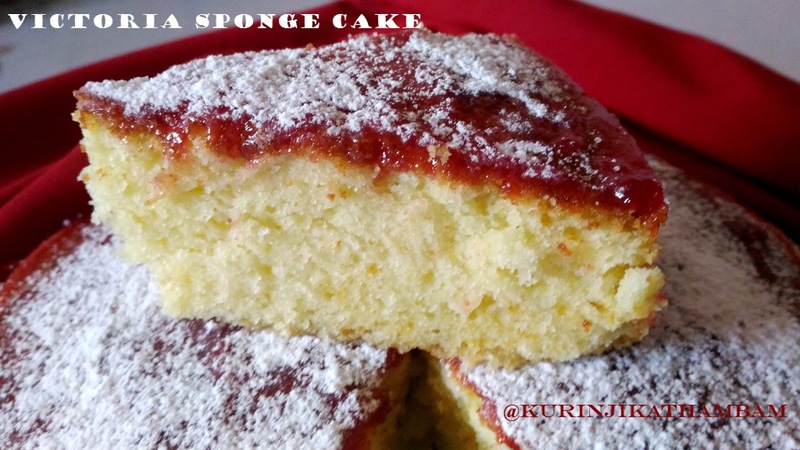 Kurinji, I haven't baked a Victoria Sponge Cake for a very very long time. That's the first cake I learnt to bake when I was 15. You brought back sweet memories.